Horizontal sliding doors connected by several door sheet into stable triangular form, wind resistant ability is very strong, a good sealing effect, light weight, flexible operation, can be manual or electric opening and closing. Industrial loading Bay Doors, hanger doors where head height is restricted and large width openings that other door systems cannot achieve. The assembly arrangement is made from galvanized steel hinged leaves, 250-300mm wide hung from the front of each picket. The folding door is manufactured from hot deep galvanized steel or stainless steel sections. 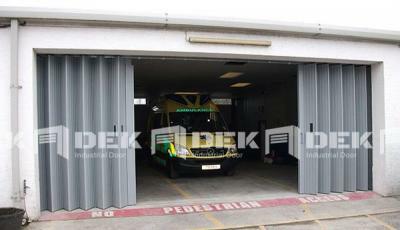 For site requirements the Folding Door can be arranged either one side or both sides of the opening. All unfixed edges are fitted with a rebated lead post with an operating handle. Electrically operated Folding Doors have a gearing system that allows torque limiting device to prevent door damage through a continuous chain driven system. Locking can be made from either side of the folding door with a Hasp and staple padlock as standard.